Good morning, Hua Xia Families! We are entering week 21st. 1) Room parents, last call for CNY tickets redeem! This Sunday, 9:30am - 1:30pm. Or, it will be considered as donation to the school CNY fund. 2) Lost & Found. We have a collection of lost & found items. Most of them are from CNY event. Please come and claim yours before it send to GoodWill. 3) Visa service this Sunday, 10 am - 2 pm. 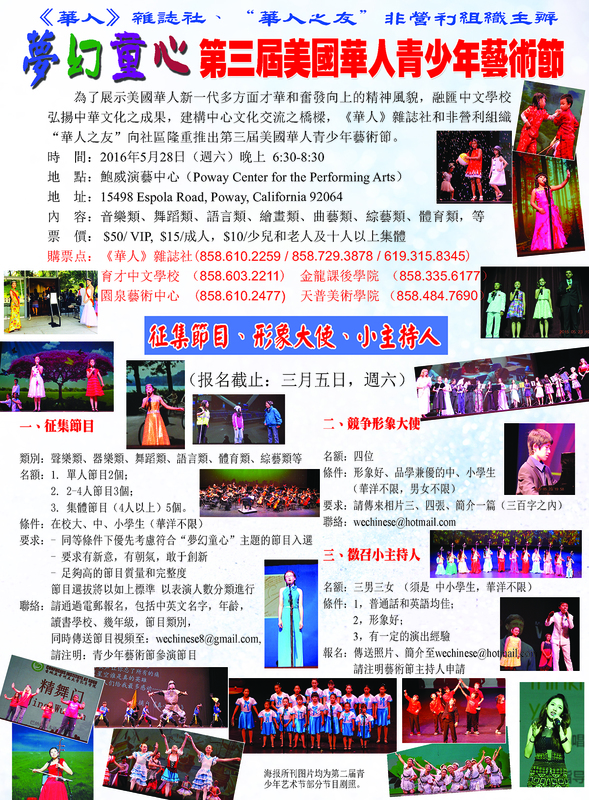 4) <We Chinese American > magazine will host The 3rd American Chinese Youth Festival. March 15 is the deadline to apply for Ambassador and emcees, as well as auditions for performance. Students, your talent is precious, and there is no better way than present it in the spotlight! Please refer to the attached flyer for details. 5) HOC Essay Contest. All students are highly encouraged to participate in this annual contest. Show your Chinese writing skills and get recognized! I know you can do it! Application is attached here again. Enjoy your day! and I shall see you all on Sunday!